On this page we'll guide you through some simple matching networks. This is a huge topic, and there are multiple solutions to every problem. Matching networks are what keep microwave engineers employed, so don't give all of our secrets away or we'll all end up down at the dog track! Joseph Henry is attributed as the first engineer or scientist that determined that power is maximized if the load is "matched" to the generator. In microwave engineering, this is one of the basic concepts. In our case, we are more often than not trying to match all manner of loads to a generator impedance of 50 ohms. Henry is a member of the Microwaves101 Hall of Fame! A word of advice... if you are designing a matching network, and don't know what elements to incorporate, find a similar design and see what the last guy did! That's how you learn what to do, and what not to do. Soon you'll notice there's a lot of great material out there, and not much new under the sun! Matching networks are used to reduce VSWR between source and load that are not of the same characteristic impedance (like Klopfenstein's taper of quarterwave transformers), or match an arbitrary real/imaginary load to an arbitrary real/imaginary generator (like an interstage in matching network in an amplifier). We usually try to keep matching networks as lossless as possible, it is very easy to cheat and create an impedance match using resistors like theL-pad attenuator! The photo at the top of the page shows a power pole like you might see if you live in either the Third World, of anywhere in the United States (why we don't bury this stuff defies logic... but that's a different topic.) 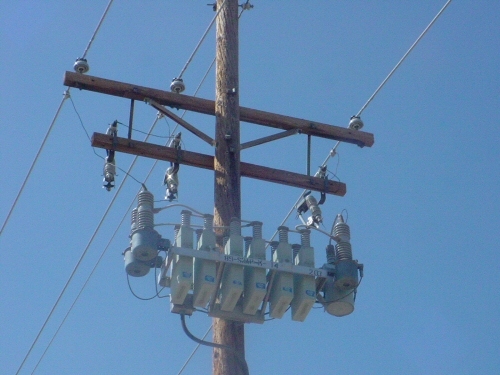 On this particular pole you can see three widgets that are connected by three wires to the three-phase power. Too small to be transformers, what the heck could they be? These are power factor correction capacitors, a type of matching network used by the local power company. A good fraction of the load that the power company drives is inductive (think about all of those motors out there running equipment). Even though power is delivered at 60 Hz (or 50 Hz in other parts of the world), an inductive load can have a significant reactance to it. Capacitors are placed in shunt across the line to compensate for inductive reactance, three capacitors are usually configured in a "Wye" network across three-phase transmission lines. The power factor is a number that is less than one, it's is the ratio of real power delivered to the "apparent" power delivered. A power factor of 1 means that a perfect resistive load has been achieved. Power factor correction is not the same as a true impedance matching, power factor correction means that the reactive component has been minimized compared to the real component of the load. Impedance matching implies that the real parts of generator and load are matched too. Why doesn't the power company take care of this problem on the generator side of the power line? By fixing the power factor at the load, the loss in the transmission line is minimized. 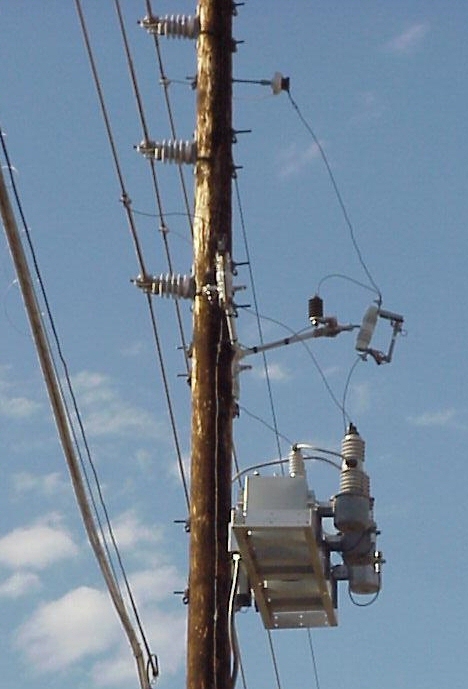 Here's another photo of a power pole with capacitors on it. We're not sure, but we think that maybe in this case the power company has the ability to switch these in and out depending on the load. Tons more to come... send us some content please!